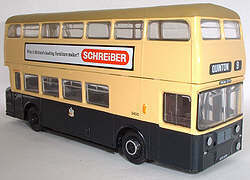 The Manchester MCW double deck body was a revised version of the bodybuilders original rear engine design. The name came from the fact that this new style was originally built for the City of Manchester Transport Department. Manchester was not however the only operator to purchase such vehicles, both Devon General and Plymouth City Transport also operated sizable numbers in the South West. A number of other varied operators across the country also purchased small quantities of this design. 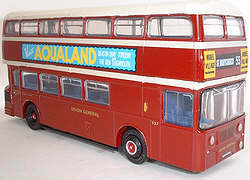 These models are very similar to the original MCW Fleetline and Atlantean castings (165 & 180) the only major differences between the two types being a new curved windscreen and the redesigned front panel below it. The Daimler or Atlantean versions are represented by the fitting of the appropriate rear engine bustle casting. Both versions of the model made there first appearance in the range in 1998, 24701 in June and 25401 in August. A further six releases followed in the remainder of 1998 but one further release as appeared since then.